But what about in College Station? Or Athens? Or Tuscaloosa? The conference schedule road map is littered with lard. So how does one navigate the unhealthy rival temptations that can literally weigh an Auburn Tiger down? Well, there’s an app for that. And hey, as Tom Haverford would say, maybe even a zert for that. 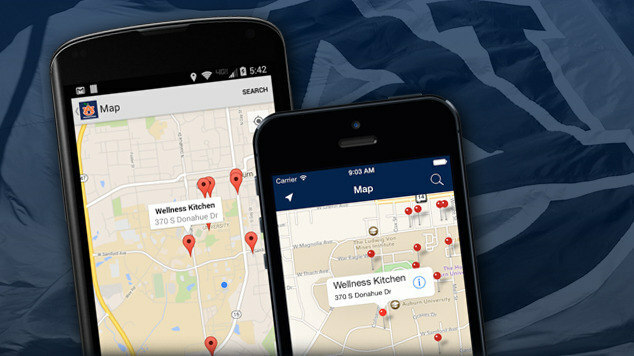 And the Tiger Nutrition mobile app will show a player exactly where it is. Created by Auburn Athletics Sports Dietitian Scott Sehnert and staff and built by the Auburn University Office of Information Technology, the Tiger Nutrition mobile app can GPS student-athletes to the best “performance-focused” meals at restaurants in all 13 SEC towns (not to mention the Atlanta airport and, sure, in Auburn, too). Users can choose specific road trip restaurants and see what’s good (for them), or search a list of good-for-you grub–we’re talking specific menu options–in their immediate vicinity curated by Senhert and Co.
And it’s not just student-athletes. Even you can download the app here.